The 2019 Ram ProMaster City from Lake Keowee Chrysler Dodge Jeep Ram in Seneca, SC - serving Anderson, Clemson, Pickens, Easley, Greenville, SC, and Lavonia, GA - takes your business further than ever before. 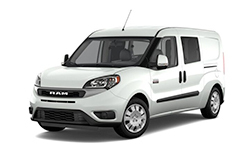 Whether you need a durable cargo van to carry supplies or a comfortable passenger wagon to haul people with care, the ProMaster City is the right choice. This powerful vehicle offers a standard, 2.4L Tigershark MultiAir® I-4 engine for impressive acceleration and a 9-speed automatic transmission for incredible control. Everything you need to secure your items is available in the cargo van, including standard tie-down loops and 180-degree rear-hinged doors. A passenger wagon can hold up to five passengers, and the 60/40 split-folding rear seat allows you to customize your storage for more people or more luggage. Every model is equipped with the standard Uconnect® 3 infotainment system, which offers the Bluetooth® hands-free phone system for added convenience. There's never been a better time to buy a 2019 Ram ProMaster City! Our inventory is quickly filling up and new auto loans are at their lowest rates in years. Take your test drive today with Lake Keowee Chrysler Dodge Jeep Ram by visiting the showroom at 10815 Clemson Blvd., P.O. Box 857, Seneca, SC. Load your Ram ProMaster City® up using the 60/40 split rear doors that lock open at 90° and can swing open to a maximum of 180° using the release button. The narrower door is positioned on the passenger side, so curb access isn't blocked when making deliveries. Enjoy easier loading and unloading at the sides with dual sliding doors that open up to an ample 26 inches. A reinforced structure and strategic crush zones help prevent intrusion into the interior, while seven airbags and active head restraints help keep you safe within. So wherever the job takes you, you can drive knowing we have your back. With a Best-in-Class payloady1 of 1,883 pounds and a maximum roof load weight of 150 pounds, you can load up anything you need with the Ram ProMaster City® Tradesman®. It can handle it. 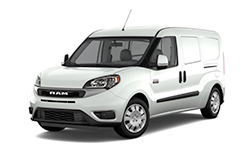 With an unsurpassed towing capacity1 of up to 2,000 pounds, you can bring along the gear necessary for work or play. 1. 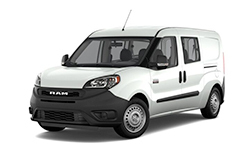 Based on the FCA US LLC Small Commercial Van Segment (Class 1).